This past Tuesday, I decided to give prenatal yoga a shot. My doctor thought it would be a good idea and I feel like a ton of people have recommended it… so why not try it? 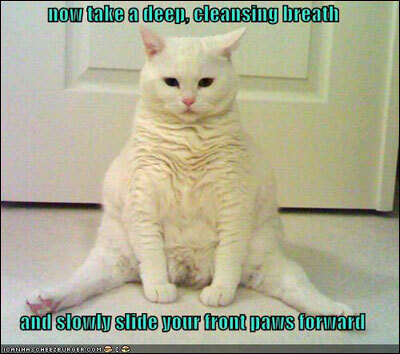 I’ve never been into yoga before though. The few times I’ve gone have been disastrous. 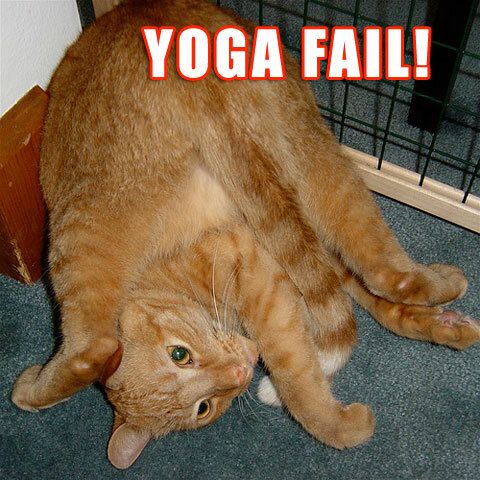 Have you ever taken a yoga class and there is a girl in the back falling down? And occasionally when she falls down she takes out the person next to her? That’s me! Always! It’s embarrassing. But everyone thinks that pregnant ladies should do yoga and my doctor mentioned that a retail store near me, Destination Maternity, offers a free class. I dragged one of my coworkers along because she often goes to yoga and because if I was going to accidentally topple someone to the floor, I didn’t want that person to be 9 months pregnant! Megan’s not pregnant, so I thought it might be safe. Turns out that while Destination Maternity is awesome enough to offer the class for free (always), they only want pregnant ladies in the room. Oops! Luckily the instructor was pretty nice about it and let Megan stay. I’m proud to say that I didn’t fall over! Not even once! Yay! I really enjoyed myself and I’m totally planning to go back. I would go for tomorrow morning’s class if I didn’t have to go to a conference this weekend. I will admit that while I was proud of myself for doing something that counts as exercise, I didn’t get that same elation that I did from running. And let me just say that I don’t think I’ve ever gotten that “runner’s high” that everyone talks about, but I ‘ve always felt so proud of myself after a run. I shouldn’t be too hard on yoga though because even if I didn’t break a sweat, my muscles were aching the next day. Specifically the muscles on the outsides of my hips. My belly muscles (I can’t even call them abs right now, that seems like a joke… even if it’s their name) were really sore the next day as well, but I don’t know if that was from yoga or just generally from being pregnant. This is going to sound stupid, but I’m going to share it in case there are readers who didn’t know this either. The whole “belly expanding” thing hurts (not a ton, but it’s uncomfortable). About 2 days out of every week, it feels like I’ve pulled or strained a muscle. And the muscle of choice changes every week. So far, it has moved up a few inches every week as the belly expansion moves higher. The strained/pulled muscle thing makes total sense, it’s just not something I ever expected/thought about before getting pregnant. I had the smallest belly. I know that women “pop” faster with their second child, but it still made me nervous that I’m doing something wrong… luckily I saw my doctor today and she says I’m right on track for weight gain and shouldn’t worry about anything. I also think it’s super awesome that Destination Maternity offers this free yoga class. They also offer free classes on Newborn Care, Lactation, and New Moms group support thing… If you have a Destination Maternity near you and you’re pregnant, you should totally check them out!